Abstract. Wind turbines are constantly exposed to wind gusts, dirt particles and precipitation. 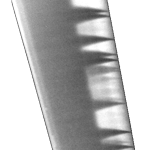 Depending on the site, surface defects on rotor blades emerge from the first day of operation on. While erosion increases quickly with time, even small surface defects can affect the performance of the wind turbine. Consequently, there is demand for an easily applicable remote monitoring method for rotor blades that is capable of detecting surface defects at an early stage. In this work it is investigated if infrared thermography (IRT) can meet these requirements by visualizing differences in the thermal transport and the corresponding surface temperature of the wall-bounded flow. Firstly, a validation of the IRT method compared to stereoscopic particle image velocimetry measurements is performed comparing both types of experimental results for the boundary layer of a flat plate. Then, the main characteristics of the flow in the wake of generic surface defects on different types of lifting surfaces are studied both experimentally and numerically: temperature gradients behind protruding surface defects on a flat plate and a DU 91-W2-250 profile are studied by means of IRT. 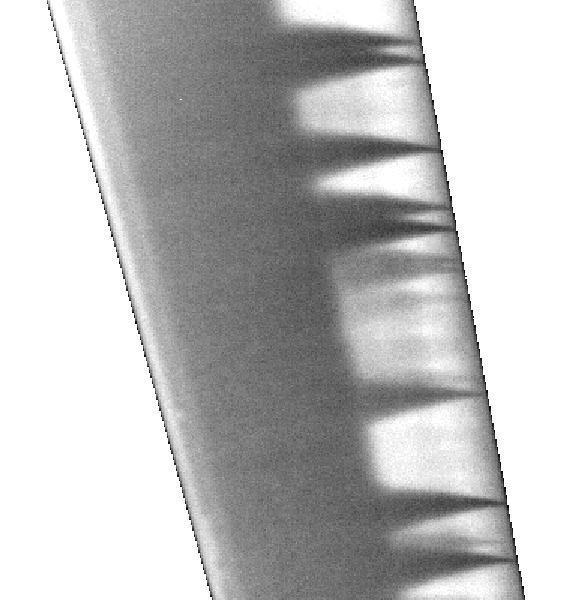 The same is done with the wall shear stress from Reynolds-averaged Navier–Stokes simulations of a wind turbine blade. It is consistently observed, both in the experiments and the simulations, that turbulent wedges are formed on the flow downstream of generic surface defects. These wedges provide valuable information about the kind of defects that generate them. At last, experimental and numerical performance measures are taken into account for evaluating the aerodynamic impact of surface defects on rotor blades. We conclude that the IRT method is a suitable remote monitoring technique for detecting surface defects on wind turbines at an early stage. How to cite: Traphan, D., Herráez, I., Meinlschmidt, P., Schlüter, F., Peinke, J., and Gülker, G.: Remote surface damage detection on rotor blades of operating wind turbines by means of infrared thermography, Wind Energ. Sci., 3, 639-650, https://doi.org/10.5194/wes-3-639-2018, 2018.